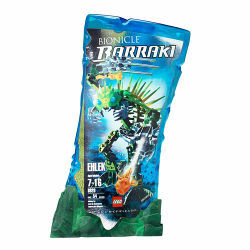 8920 Ehlek is a BIONICLE set released in 2007. He is one of the six Barraki. He is green with blue eyes and has two Protosteel Tri-talons on his hands, spikes lining his back and a Squid Launcher in his left hand. There are two holders for the two Sea Squid that he comes with on his right hand. In the BIONICLE universe, he commands an army of venom eels. This is a description taken from LEGO.com. Please do not modify it. (see an archive of the product's page) Sinister serpentine foe! Enemies who think Ehlek is an easy target are in for a shocking surprise! If his sea squid launcher and claws are not enough to protect him, he can use his spines to send out electrical bolts at his opponents. With an army of venom eels at his command, Ehlek is out to destroy the city of Mahri Nui! Includes squid launcher with 2 squid. Each Barraki features a unique body, face and weapons - collect them all! This page was last edited on 28 April 2016, at 18:05.